Edward Vines Spencer of Oneonta drove tractor-trailer until age 80. ONEONTA – Edward Vines Spencer passed away on Tuesday, Feb. 6, 2019, at Fox Nursing Home, surrounded by loved ones. He was 93. Ed was born May 4, 1925 in Pittsfield, to George and Ida Spencer. He fondly remembered growing up on a farm with his parents and two brothers Don and Bob. He enjoyed reminiscing about the farm animals, particularly two work horses named Dolly and June and the family dog Pal, who “knew how to fetch a cow.” He graduated from Morris Central High School in 1943. 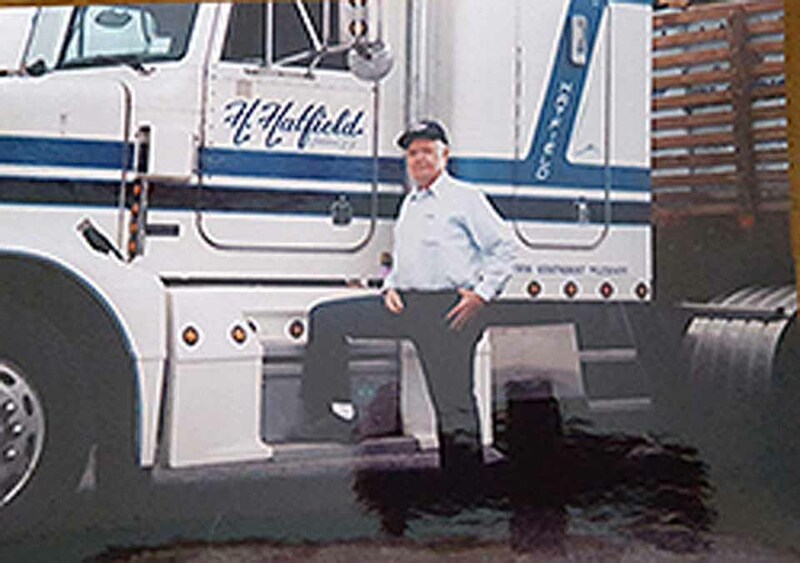 He was a dairy farmer for many years before he found his true calling as a tractor-trailer driver, a profession he continued until he was 80 years old. He loved flowers and sunsets and was wise enough to stop and appreciate them. His favorite color was green and he never tired of looking to the hills full of trees to see that color. He loved fishing, camping, and the open road. He loved to sing and had a wonderful voice. He was an avid reader of westerns and passionate about old-time country music. He never ever had an unkind word for anyone. He had a fierce, unflagging love for his family. He is survived by his brother Robert and Robert’s wife Joyce, and by two daughters and five sons, Pamela Stewart and her husband Eric, of Oneonta, Ed Spencer and his wife Linda, of Oneonta, Peggy Hamilton and her husband Raymond, of Oneonta, Eddie Spencer and his wife Donna, of Utica, Jack Spencer and his wife Wanda, of Ithaca, Jerome Spencer, of Johnson city, Tenn., Errol Spencer and his wife Carmen, of Jacksonville, Fla. He is also survived by 15 grandchildren and 13 great-grandchildren. Ed was predeceased by his brother Donald Spencer, his sister-in-law Joanne Spencer and his wife Kathy. A celebration of life service will be at 1 p.m. Monday, Feb. 11, at the Morris United Methodist Church, with committal to follow at the Fairview Cemetery in New Berlin. There will be an opportunity to visit with family and pay respects to Ed at noon. A special thank you to the people at the Fox Nursing Home and Hospice for their warm devoted care and support during his final days, and to the loving staff at the Hampshire House, where he lived for six years and enjoyed many friends. Those that loved him should find peace in the knowledge that they now have another Angel watching over them.